Since trash cans were removed, dog poop and other refuse are piling up at Malibu Beach Wildlife Management Area, which most locals simply refer to as dog beach. The area touches the bay behind Ocean City and is home to a colony of endangered beach-nesting birds. In this case, the enemy was bureaucracy, including the New Jersey Department of Environmental Protection. Late last July, the DEP confirmed that refuse containers at Malibu Beach Wildlife Management Area, which is better known as “Dog Beach,” had disappeared. The state land sits on a causeway connecting Ocean City, Longport and Somers Point, between Atlantic and Cape May counties, but technically the beach is part of Egg Harbor Township in Atlantic County. The folks at the DEP have just acknowledged they did, in fact, remove the containers. As part of the bureaucracy, department brass were not immediately aware then that its Division of Fish and Wildlife had removed the cans because Cape May County had stopped collecting trash. “This caused the receptacles to overflow … big time. With no one to collect the trash, we had no choice but to remove the receptacles in hopes of discouraging the growing mounds of refuse,” DEP spokesman Larry Hajna explained in a recent email. 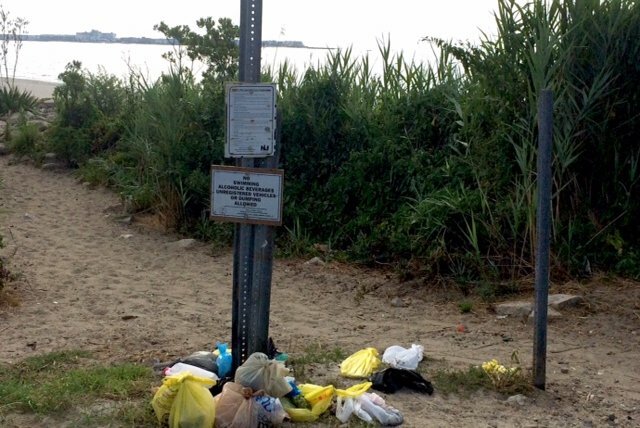 The unintended consequence was “folks decided to plop their poop bags down next to the beach,” wrote Hajna. Hajna noted most state-owned lands have a carry-in, carry-out policies, though Malibu Beach was an exception. Now, Ocean City is planning to place a mobile refuse collection bin at the beach and empty it twice a week, from May through October. The plan is under review by the Division of Fish and Wildlife, the same folks who spirited away the trash containers in the first place last summer.